In this SAP Press book chapter excerpt, find introductions to material master data and vendor master data types used in SAP materials management. easier. In this SAP Press book chapter excerpt, find introductions to common data types used in SAP materials management, including material master data and vendor master data. A number of master data files in Materials Management require a significant amount of understanding, not only on the part of the SAP consultant but also on the part of the SAP customer. When implementing SAP, customers are generally transitioning from one or more legacy systems. A key aspect of any implementation is the conversion of data to the master data files in SAP. A fundamental indicator of a successful implementation is the level to which the data has been correctly converted into the SAP master data files. In this chapter, we will examine the master data files that are integral to the practice of materials management. 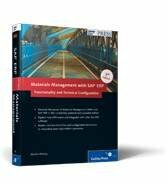 This excerpt from Materials Management with SAP ERP: Functionality and Technical Configuration by Martin Murray is reprinted here with permission from SAP Press, copyright 2011. Download a PDF of this chapter. The Material Master is the repository of the data used for a material. The Material Master is more than a single file for each material, it is where all information on a material is entered and accessed from. It is used throughout the SAP system. When customers implement SAP, they are often overwhelmed by the information contained in the Material Master file. When customers examine their existing systems, such as BPICS, JDEdwards, or Lawson, they find that their product or material files contain a fraction of the data contained in the Material Master in the SAP system. The Material Master transaction allows the users to enter all of the information relevant to a particular item of material into the correct tables. The Material Master isn’t just a single file but a number of tables of information that combined reflect all of the information for that material. Many tables are updated when information is entered into the Material Master transaction. The Material Master transaction is structured so that there are entry screens for different functional information such as Purchasing, Sales, or Accounting, but there is also an organizational dimension to data entry. The material information can be entered at each level of the organization, for example, at the levels of plant, storage location, or sales organization. An issue that SAP customers can face when converting their item files over to the Material Master is whether to keep their legacy numbering scheme. This means they would continue entering their own material numbers. 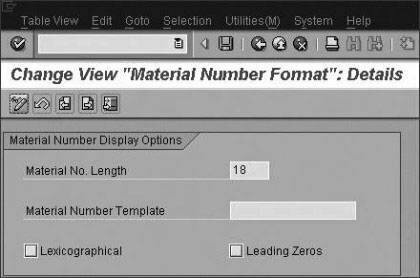 They have the option of allowing SAP to automatically assign material numbers. Often, legacy systems have meaningful material numbering. This numbering has usually been in place for some time, and staff members are familiar with the numbering. For the simplicity of maintenance, automatic assignment of material number is the best choice. When working with your client, be aware that there are arguments to use and not to use a meaningful numbering scheme in SAP. The material number field is defined in configuration. Use Transaction OMSL or the navigation path IMG • Logistics – General • Material Master • Basic Settings • Define Output Format for Material Numbers. Figure 3.1 shows the configuration screen for defining the output format for material numbers. 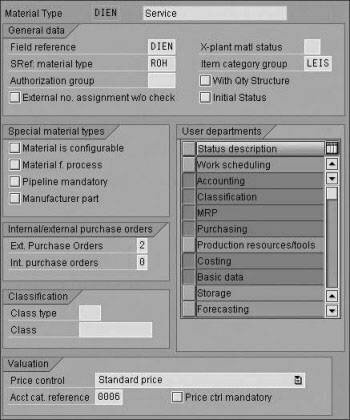 This configuration screen does not have many input fields but is extremely important when initially defining the Material Master. After your customer has decided upon the Material Master numbering scheme, you can first enter the length of the material number. Then the customer may decide that it needs the automatically assigned material numbers in a certain format that can be defined. In this case, you can define the template and the special characters required. Figure 3.2 shows the template defined for internally assigned material numbers. Figure 3.2 Template for Internally Assigned Material Number. In this case, the customer requires the material numbers to appear as this example 123@45678901@23456. The only character that cannot be used in the template is the underscore because that is used to signify a non-template field. The two other fields in the OMSL transaction have to do with how the material number is stored and how SAP determines what the number is. The Lexicographical indicator is only relevant for numeric material numbers, either internally or externally defined. In Figure 3.2, the indicator is not set, which means that the numbers are stored with leading zeros that are right-justified. For example, if a user enters the number 12345678, the number will be stored as 000000000012345678, for example, with 10 leading zeros. If the indicator is set, then the numeric number is not right justified and not padded with zeros. The field acts more like a character string, where a leading zero becomes as valid character. In the following example, the indicator is now set. A user entering material 12345678 would find that the material number would be stored as 12345678, with no padding. If the user then entered 0012345678, it would be stored in that way, and this would be a different material number in SAP. However, an internally assigned material number would be padded with the leading zeros, 000000000012345678. Therefore, there would be three separate material numbers. Remember that this indicator cannot be changed after there are numeric material numbers in the system, so it must be defined before any tests are run in the system. The other field in Transaction OMSL is the Leading Zeros indicator. If this indicator is set, then the material number is shown with the leading zeros. However, if the Lexicographical indicator is set, then the Leading Zeros indicator is ignored by the system. When the definition of the material number has been decided upon, the configuration for the material number range can be completed. 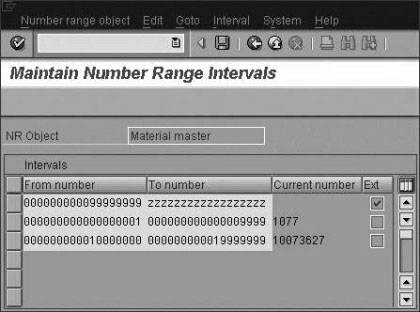 The material number ranges can be configured in Transaction MMNR or via the navigation path IMG • Logistics – General • Material Master • Basic Settings • Material Types • Define Number Ranges for Material Types. The transaction allows a range of numbers to be entered and the option to make that range either external or internally assigned. Figure 3.3 shows the number ranges defined for internal and external number assignment. A material type is a definition of a group of materials with similar attributes. 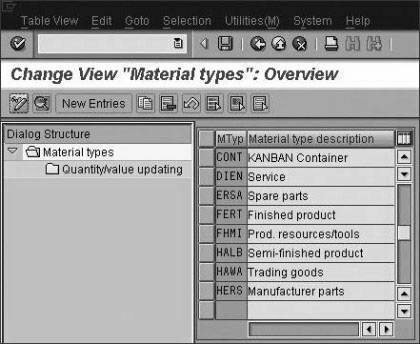 A material type must be assigned to each material record entered into the Material Master. The transaction for the material type definition is OMS2. The transaction can be accessed using the navigation path, IMG • Logistics – General • Material Master • Basic Settings • Material Types • Define Attributes of Material Types. The material type is configured so that fields in the Material Master are predefined for the materials assigned to that material group , as shown in Figure 3.4. For example, you can configure the price control for a material type to be Standard Price, and all materials assigned to that material type will be standard price. After the material type has been created, the attributes can be defined. Figure 3.5 shows the attributes that can be assigned to each material type. After the material type has been defined, then the number range can be assigned. Now we have looked at the details that go into making up the Material Master. The next section will explain the functionality of another important element in the Materials Management functionality, the Vendor Master. The Vendor Master is an important master file that contains the information on a supplier required for purchasing any material or service. We define a vendor as a person or company who supplies materials or services to the person or company requiring those materials or services. For SAP customers, every supplier that they need to convert from their legacy systems will require a Vendor Master record in SAP. The Vendor Master in SAP holds details about each vendor used by the customer. The Vendor Master has three distinct sections. These are discussed in some detail in the following subsections. The general data is, as the name suggests, general information about the vendor that can be entered into the system by the group identified to create vendor records. The basic date entered at this level includes name, search terms, address, telephone, and fax. After this data is entered, further information can be added to the Vendor Master record by Accounting and Purchasing. This data can be entered using Transaction XK01. The accounting data is the financial data that is entered at the company code level. This data includes tax information, bank details, reconciliation account, payment terms, payment methods, and dunning information. The transaction used in The purchasing data is entered for the vendor at a purchasing organizational level. We will discuss the purchasing organization later in the book. The data entered is relevant for one purchasing organization and may be different between purchasing organizations. The data entered includes control data required in purchasing, partner functions, purchasing default fields, and Invoice Verification indicators. This data can be entered using Transaction MK01. When you create a vendor, you must assign an account group to that vendor. Therefore, these account groups must be defined in configuration before vendor creation. The account group is defined using the navigation path IMG • Financial Accounting • Vendor Accounts • Master Data • Preparations for Creating Vendor Master Data • Define Account Groups with Screen Layout (Vendors). In Figure 3.6, you can see the existing account groups. If you need to define another account group, click on the New Entries icon. The screen shown in Figure 3.7 will appear. On this screen, you can specify whether an account group is just for one-time vendors. For vendors that you only deal with once, their data is entered into the document and not as master data. 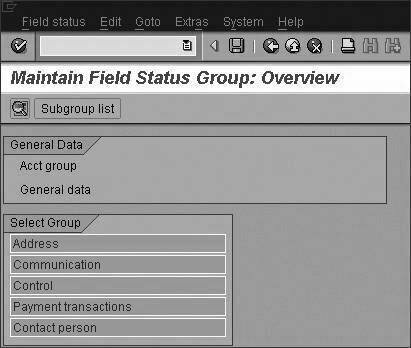 After you have entered the account group and description, you can then modify the field status as needed. This transaction allows you to configure the system to show or to not allow users to enter information into certain fields. Highlight the field status for the general, company code, or purchasing data, and then click on the Edit Field Status icon. Figure 3.8 shows the specific field groups that are available to configure. For the general data screen, these are the Address, Communication, Control, Payment transactions, and Contact person groups. Double-click on the group you want to configure. 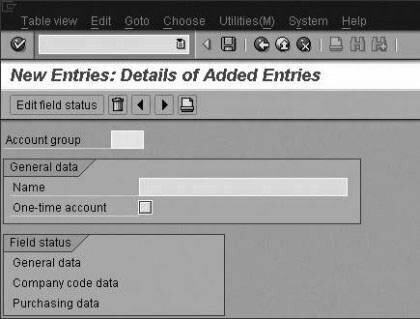 This configuration screen, shown in Figure 3.9, allows you to make certain fields either a required entry or an optional entry because they all are in this figure; display only, or suppressed. This configuration becomes specific to the account group that is entered when a Vendor Master record is created. The screen layouts can also be modified for company code using the navigation path, IMG • Financial Accounting • Vendor Accounts • Master Data • Preparations for Creating Vendor Master Data • Define Screen Layout per Company Code. The screen layout can also be modified by the particular activity. In other words, the screen for creating a vendor can be modified to appear different from the screen for modifying a vendor. The transaction is accessed using the navigation path, IMG • Financial Accounting • Vendor Accounts • Master Data • Preparations for Creating Vendor Master Data • Define Screen Layout per Activity. 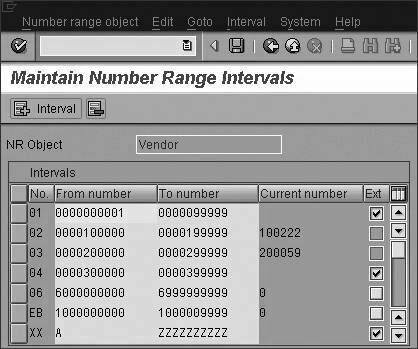 When defining the vendor number range, it is important to remember that vendor numbers, like material numbers, can be externally or internally assigned. Many SAP customers decide to create different number ranges for each of their account groups. This requires careful consideration when defining number ranges to prevent the number ranges from overlapping. The transaction to create vendor number ranges is XKN1, or you can use the navigation path, IMG • Financial Accounting • Vendor Accounts • Master Data • Preparations for Creating Vendor Master Data • Create Number Ranges for Vendor Accounts. Figure 3.10 shows the configuration for vendor number ranges. For this transaction, you should enter a unique number for the range, defined by a two-character field, and then the range for the numbers for your defined number range. The Current number field allows you to define the current number. The Ext. field allows you to define whether the number range is externally, or user, defined. After the number range is defined, it can be assigned to a vendor account group using the navigation path, IMG • Financial Accounting • Vendor Accounts • Master Data • Preparations for Creating Vendor Master Data • Assign Number Ranges to Vendor Account Groups. 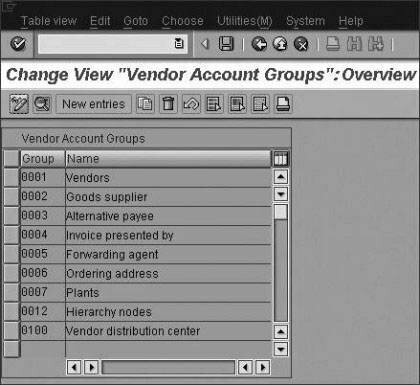 The number range can be assigned to many vendor account groups, as shown in Figure 3.11. 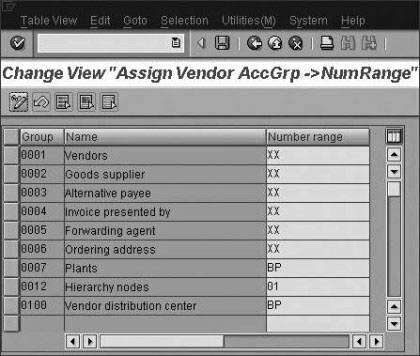 Therefore, if your SAP customer decides to use just one number range for all its vendors, the configuration would show one number range assigned to all account groups.